Now in its silver anniversary year, the Ian Wardlaw Drama Trust celebrates with a visit from one of Scotland’s busiest star actors. “An Evening with” has already seen popular occasions when Brian Cox, David Hayman, and Liz Lochhead supported the Trust’s fundraising through a live Q&A hosted by the Trust Patron, Professor Jan McDonald. 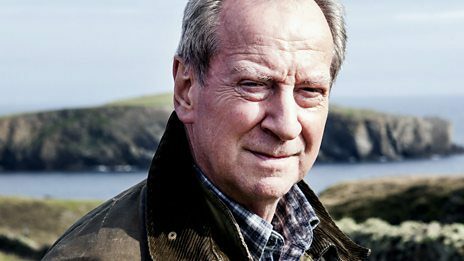 BILL PATERSON, who received a well-deserved Lifetime Achievement BAFTA in 2015, was born in Glasgow, and graduated from the Royal Scottish Academy of Music and Drama (now the Royal Conservatoire). After seasons at the Citizens Theatre as an actor, he was later assistant director of the youth programme, and appeared, with Billy Connolly, in the infamous “Great Northern Welly Boot Show” of the 1972 Edinburgh Fringe. He was a founder member of 7:84, touring Scotland, the UK and Europe with “The Stag, The Cheviot and the Black, Black Oil” in the premiere production. It would be true to say that since then he has scarcely ever been off the stage, film or TV screen, or radio. Appearances in “Outlander”, “Fleabag” on BBC3, and the thriller “Shetland” have been interspersed with stage appearances in “Waiting for Godot” at Edinburgh’s Royal Lyceum (with Brian Cox, John Bett and Benny Young), in London at the Royal Court, the Donmar Warehouse and the Royal National Theatre, as well as regular appearances during the Edinburgh Festival. Recently he has worked with a stellar cast (Toby Jones, Bill Nighy, Tom Courtenay, Michael Gambon, Catherine Zeta Jones) to re-create Private Frazer in “Dad’s Army” on film, which makes a connection with Dumfries; it was John Laurie, the Dumfries-born actor, who created the role of Private Frazer in the original TV series. Bill has appeared in many long-runninng series, from Dr Who to Wives and Daughters, and Foyle’s War, recognised for an outstanding performance in “Crow Road”, and his warm voice is familiar as a narrator on radio, voice-over for TV, and as commentator for the Edinburgh Tattoo. Not content to be a busy actor, Bill Paterson has written plays for stage and radio, and a series of stories, published in 2008, “Tales from the Back Green”, earlier broadcast on Radio Scotland. He has recorded many audio books, including Ian Rankin’s Rebus, and continues to pack his diary with work in a range of media. The Trust is delighted to be able to secure this rare opportunity to hear Bill in person in Dumfries. As with earlier events, the evening will explore Bill’s career in conversation with Professor McDonald, and invite questions from the audience. The Trust exists to encourage and support people in Dumfries & Galloway to further their interest in theatre, and offers financial support to assist candidates to undertake training relating to the theatre and performing arts. Next articleCan You Find Eight People You Want To Spend The Night With?